In so much that an artist does, past work experiences becomes a source for new art. I think about how my past jobs inform and relate to current themes in my work. I’ve had a lot of different jobs-ornamental plasterer, carpenter, welder, house painter, sauna builder, college professor, and art preparator. 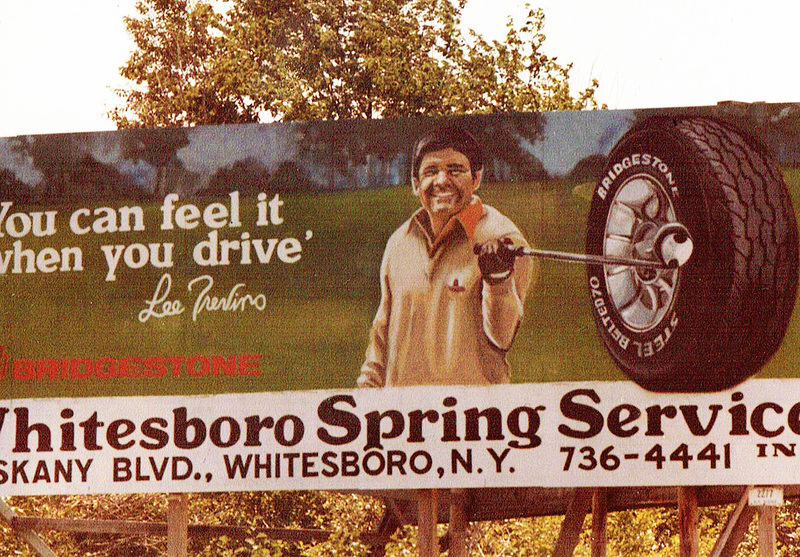 The first steady job I had was painting billboards during my summers off from college. 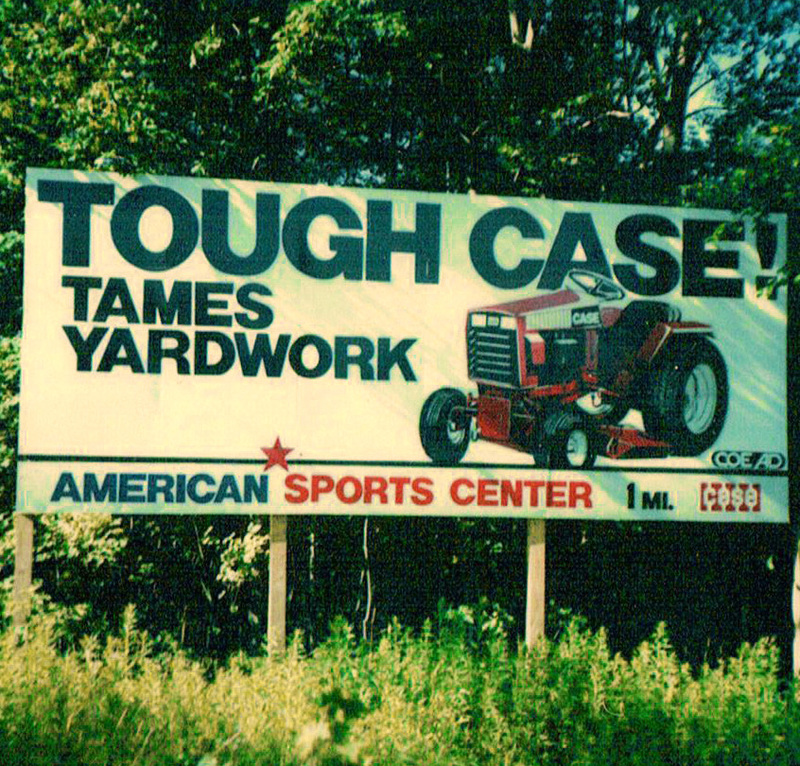 Each May, I would leave school as soon as possible and head back to the foothills of the Adirondacks where I had a job with Coe Advertising in Barneveld, NY. I suffered through living with my parents while I worked 40-60 hour weeks, until I earned enough cash to pay off the bursar when I returned to school in September. My boss, Ralph Coe, knew I was his golden boy the day I showed up for an interview for a job he hadn’t posted. I was compensated well: by the second summer my weekly paycheck equaled my father’s-who was not only an architect, but ironically had once painted signs himself and taught me how to letter. In 1972, when I was 11, we painted the banner “ We Love the Blue Raiders,” which swung over Main Street during the Trumansburg homecoming parade. Painting signs was not without its personal conflict: although I didn’t care for football and the charade of the homecoming pageant, I loved making that banner. 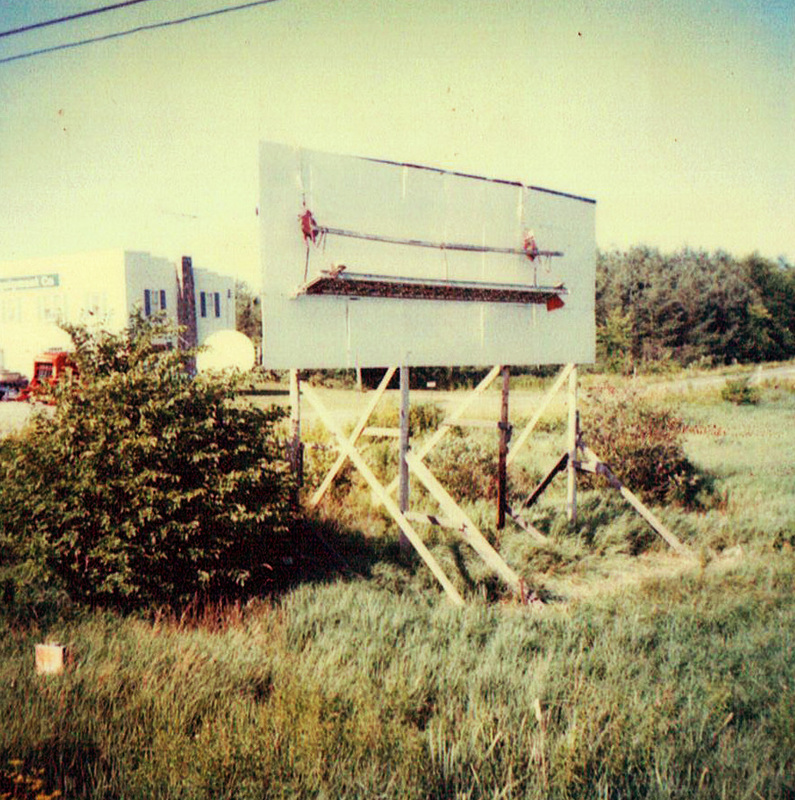 I hated billboards in general, especially the ones which interrupted the roadside view as you drove towards the wilderness, but I loved the job. 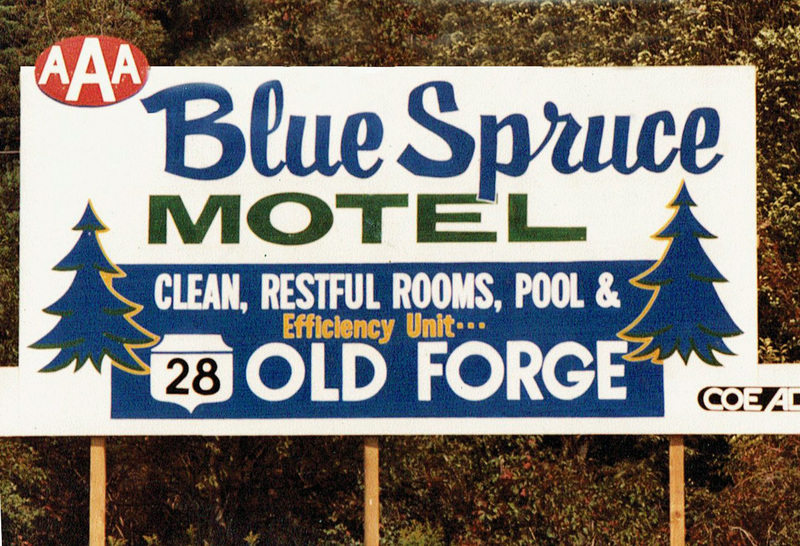 If you drove to Old Forge and beyond at any time between 1980 and 1985, you saw my artwork. My moral justification was: if those signs were going to be there, they should finance my art career. Now, I look back on many of them with a nostalgic fondness; they were the last of an era, soon to be replaced by digital avatars pasted up by hard hat crews with no artistic training. 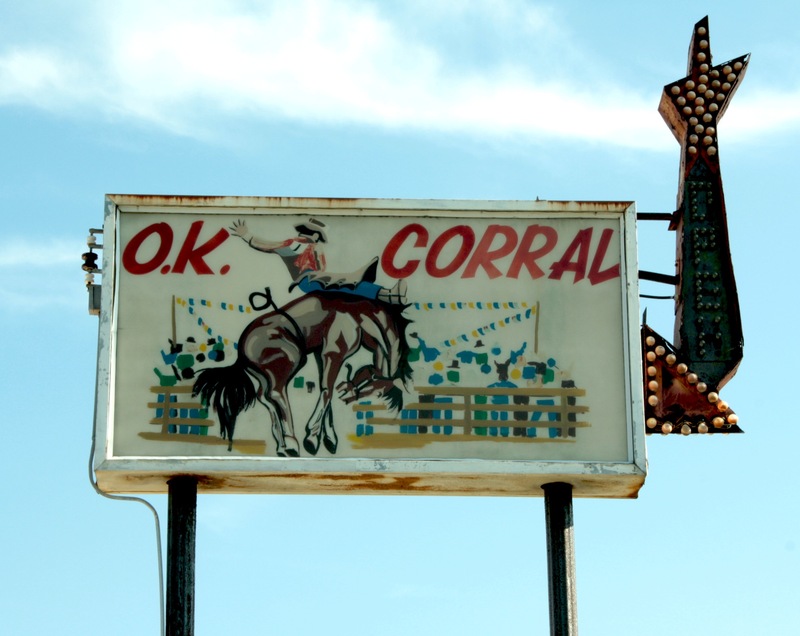 The last remaining sign that I painted: a back-lit plexiglass light box sign for the OK Corral, in Remsen, was still in place last year, even though the diner was boarded up. Besides being a functional beacon to highway travelers, it became a local cultural icon whose irony was probably most obvious to me. The crude painting of a cowboy on a bucking bronco announced a place only imagined to most travelers in those parts. It did, however, capture the boom and bust spirit of the lower Adirondacks, a region where starting a business was as risky as picking a bar fight in Tombstone, Arizona; home of the original OK Corral. I called it the “culture of failure”. I painted signs for many places that were struggling. As we said in the sign business, a good sign will only get the customer through the door-the first time. I painted billboards and signs for all sorts of businesses up and down Route 12 and 28. Places with endearing cornball touristy names such as: The Buffalo Head Inn, Deer Meadows Motel, and The Rendezvous. Most of these were one-of-a-kind signs, painted in place, with me balanced on a twelve-inch wide plank, juggling cans of paint, brushes, and spray paint. Sometimes I got lucky and did the panels in the shop, which we would put up later. They ranged in size from twenty-four to forty feet long. My layout tools were simple and “old school”: a wooden yardstick, tape measure, grease pencil, a string compass and chalk line. Sometimes I’d make a pattern in the shop, using a tracing wheel to poke holes in the paper and then use a chalk bag to dust it onto the billboard, but usually I’d just sketch things out in place. I’d work from a postcard sized design–usually completely out of proportion to the actual sign-that Ralph would hand to me as he sent me on my way. After that, I’d be my own for two to three days. People were happy with my work and despite my long hair, which drew comments straight out of a Bob Seger song, I was a celebrity at many a diner—where we ate for free since they owed Ralph so much money. 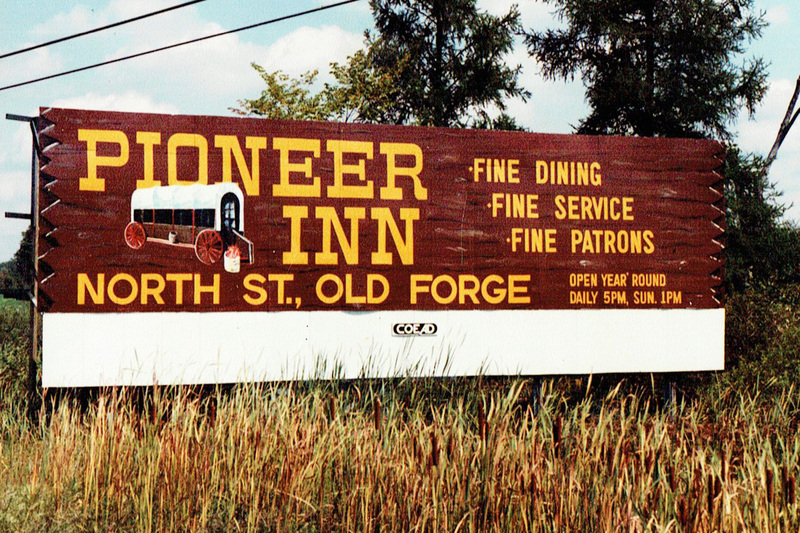 I liked painting cars and machinery and animals: my airbrushed (spray painted) version of the famous “Buffalo Head” was never surpassed and I did a pretty good moose for the Big Moose Inn, but I was terrible at people. Lettering was pretty straightforward, but it was the spacing that was critical. When you kern in Illustrator, you can tweak the whole line but with paint it was one letter at a time. A “turp” soaked rag was my eraser and stepping back to view the work was never an easy option when on a plank twenty feet in the air. Counter to intuition, serifs made lettering easier; the little flags created flow and compensated for awkward spacing. Focusing on one letter at a time and working forwards and backwards from the center made it pretty easy to misspell words. I can’t tell you how many times I looked up from the front seat of the truck during lunch and was horror-stricken by what I had written. Maybe that’s why cars always honked at me. Some days I’d get so absorbed in my work I’d forget lunch altogether. Nice post! I’d love to see if this leads to something new, but these are just great. Wonderful post! beautifully written. Hope that Chris Wolff sees this. Love to read your musings, Rob! Clever, insiring food for thought. Quite a gift you have…in many ways! Thanks for your brilliant writing and for letting me in on a part of you I did not know. It must be something to see your innocent young work out in the world like that! And by the way, they are seriously nice signs!! Well, I can’t take all of the credit for the signs- they were Ralph’s designs. But I did have to tweak the layout a lot to get them to fit! I knew about this chapter! A very nice retrospective, Rob.